1. Learn IR codes and use them to build any control interface you want, with macros including a mixture of (xLobby Control elements, IR, RS232 or any xLobby service) as well as boolean logic structures. 2. Output to 3 discrete IR zones, 2 external (rear of xLobby hardware) and one front panel IR emitter for immediate testing. 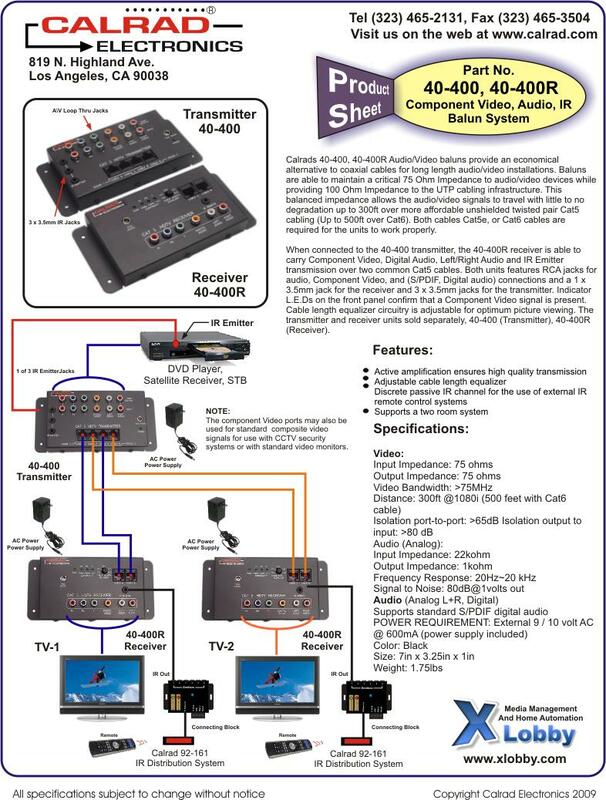 So for example control two Direct TV receivers independently while using the third IR output to flood the rack with the built-in front panel IR emitter. 3. 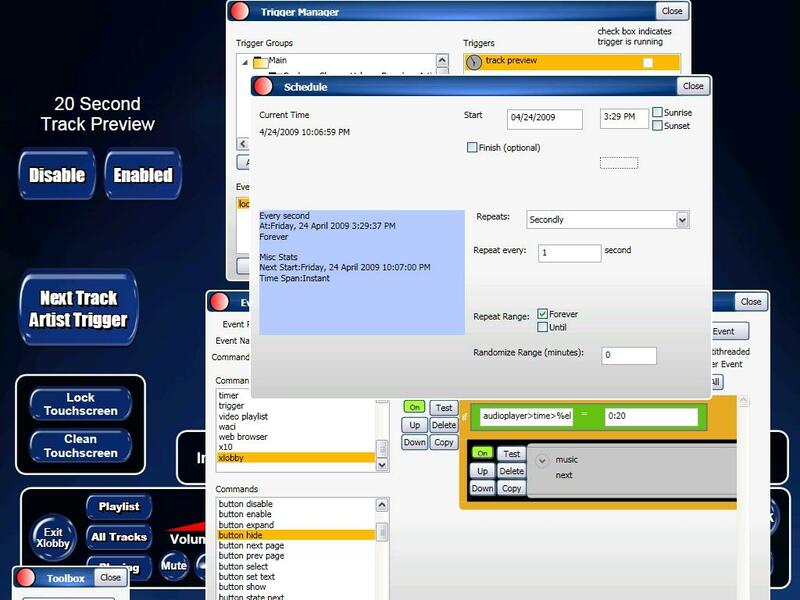 Learn virtually any remote and map its commands internally to be used to control xLobby. This makes it possible for xLobbys remote to work at the same time any other remote that has been mapped internally to xLobby to work at the same time or you can enable or disable xLobbys remote and just a single remote will work. This makes it possibe for any remote to control xLobby if needed or to be added on top of the existing xlobby remote commands to create more buttons to use in a universal remote. 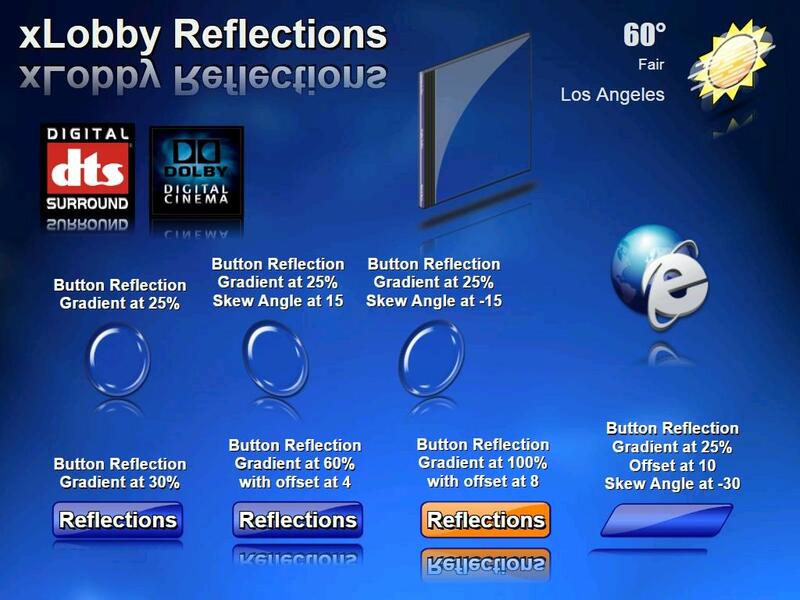 The next release of xLobby will have premapped buttons for MCE, Kaleidescape and more to come so you can install xLobby that already has a certain products IR codes availble and start using xLobby without any programming or learning IR commands. 4. Convert any IR code to RS232 or IP triggers. 5. 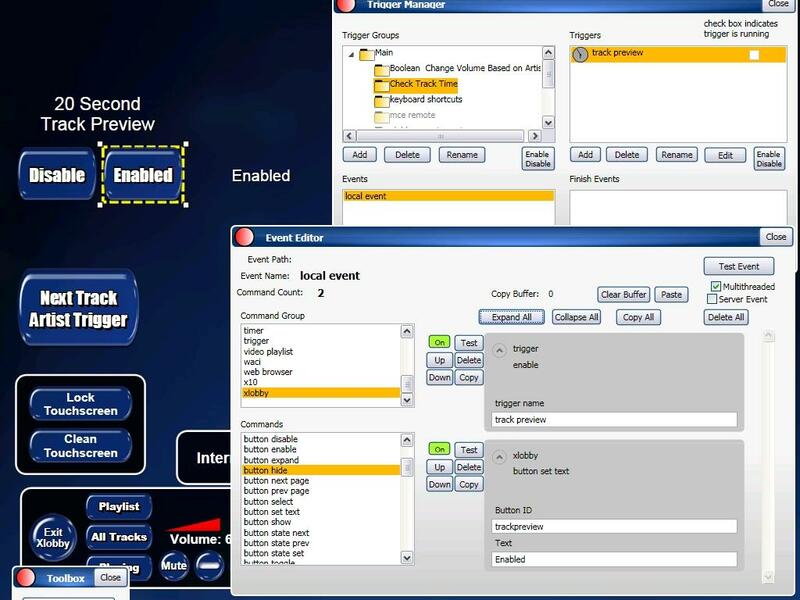 Any networked xLobby can receive IR commands and route them to any other xLobby system on the network and rebroadcast the IR code, no need for IR distribution blocks or cabling between machines. 0000027: [generic] no boolean logic exists in v3, if/then/else/repeat/>/=/</and/or/not (stevenhanna6) – resolved. – 0000015: [generic] boolean logic for book mark popup (stevenhanna6) – resolved. – 0000474: [client/server] client server, crash on large database files 15MB+ (stevenhanna6) – resolved. – 0000468: [skin editor] width and height do not update in real time while resizing objects (stevenhanna6) – resolved. – 0000476: [client/server] playlists are compared before refreshing for speed (stevenhanna6) – resolved. – 0000479: [triggers] schedule trigger, would overwrite repeat setting to 1, and forever to true (stevenhanna6) – resolved. – 0000481: [triggers] enable/disable schedule trigger does not cause reinitialization (stevenhanna6) – resolved. – 0000475: [client/server] databases are updated for speed instead of re downloading all the time (stevenhanna6) – resolved. 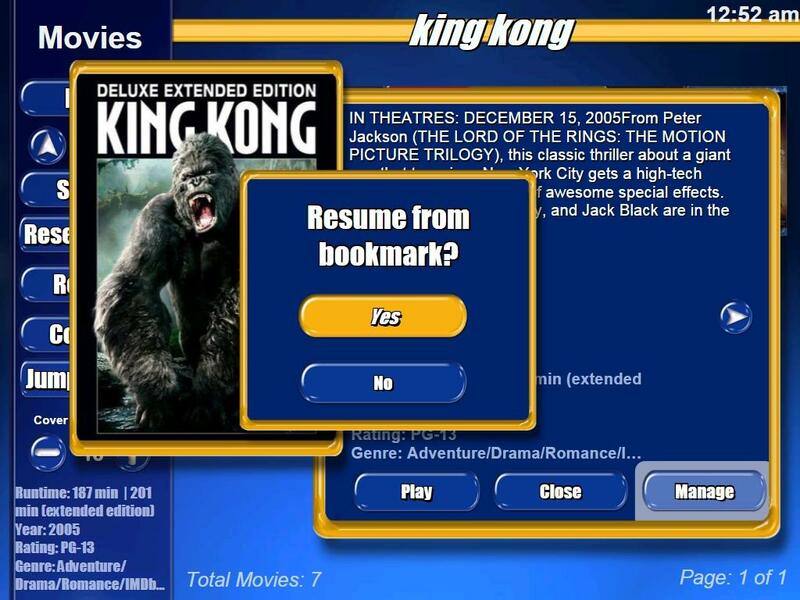 – 0000473: [generic] bookmark popup, give user choice to resume from bookmark or not (stevenhanna6) – resolved. – 0000478: [client/server] auto connect sometimes would connected twice causing crash (stevenhanna6) – resolved. – 0000480: [triggers] short secondly schedule triggers would not startup correctly (stevenhanna6) – resolved. – 0000482: [triggers] should only be able to edit one trigger at a time (could cause data loss) (stevenhanna6) – resolved. Over the next several days I will be posting more details on how to use the new Boolean logic features in the current V3 release. 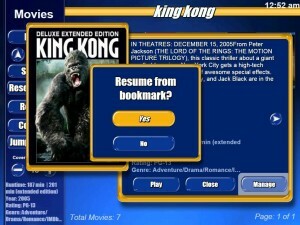 For an immediate example open the skin editor, look at the screen movieviewer. The screenshots above are of xLobby Boolean Logic in action. 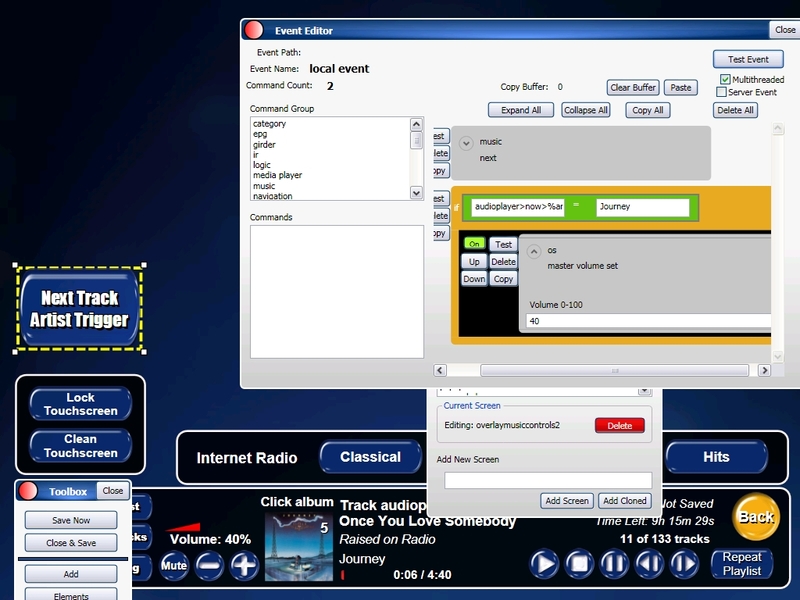 The Next Track Artist Button is controlling the local event you see. 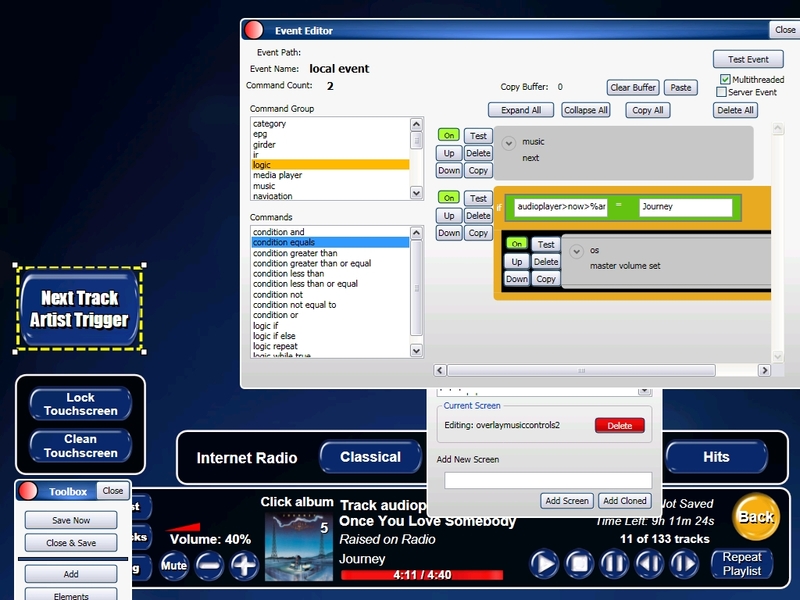 The first command in the event moves to the next track of the currently playing playlist which in this case is playall artists and tracks. The next event is the Boolean logic event that uses a Logic If command with a Condition Equals command dropped on top followed by a OS Master Volume set to 40 command, see screen shot 2. So the condition event states that during a track next chage if “audioplayer>now>%artist%” = “Journey” then set the master volume to 40%. So simply put anytime the artist Journey is played the master volume will goto 40%. 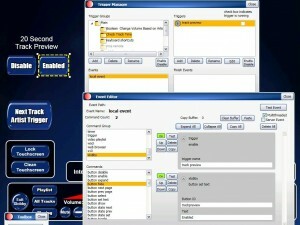 This xLobby Boolean logic example above demonstrates the use of the xLobby Triggers feature. The screenshots show 2 buttons, Disable and Enable that turns the 20 second track sample feature on and off. Here is the details: A trigger Group was created called Check Track Time with a trigger called Track Preview, the trigger is set for 1 second to look at the local Boolean event that monitors the track time position for change, when it gets to 20 the event becomes true and the event to move to the next track is triggered. The Disable and enable buttons simply Disable\Enable the trigger with a button set text to show the status of the buttons. This feature when enable will let users sample each track from a selected artist or from a large loaded playlist for 20 seconds to see if they like a particular song before moving to the next track automatically. xLobby uses the winamp M3U file format for creating playlists in xLobby. Whats interesting about the M3U file format is that users on a network using a laptop or PC that has winamp software loaded with the playback file structure mapped to the same playback folder structure as xLobby can create playlists using winamp and store them directly in the xLobby playlist folder for example:(c:\programs\xLobby\playlists) so multiple users can create playlists outside of xLobby that will show up in the playlist manager of xLobby that was created from multiple users. 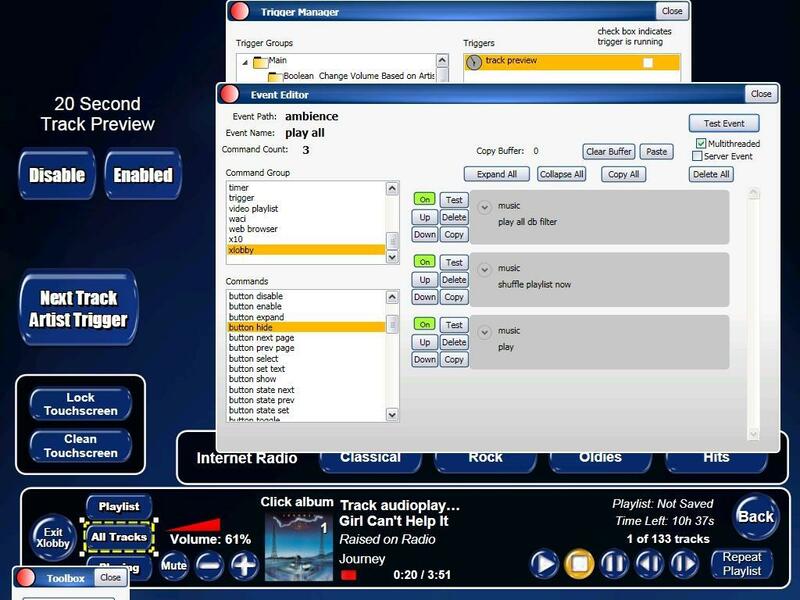 Any xLobby system can also save playlists to a shared folder on a NAS or xLobby server so all users have access to the same music playlists. Also playlists created in xLobby are also usable for playback in winamp. 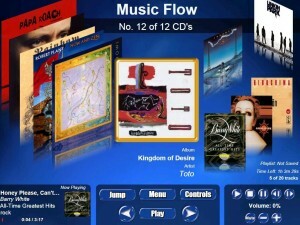 Future plans include importing of playlists ftom Windows Media Player and Itunes. Calrads new HDMI cable tester is extremely useful for testing interconnect HDMI cables or when pre-wiring your installation, helps check cables before they are permanately installed in a wall prior to installation of the A\V equipment. The 65-270 only checks for continuity and does not test for poor shielding or validate the full HDMI 1.3b specification for proper signal integrity or digital handshaking. Calrads new 40-880A converts VGA , RGB+HV video to HDTV component and HDTV Component video to VGA, RGB + HV video. 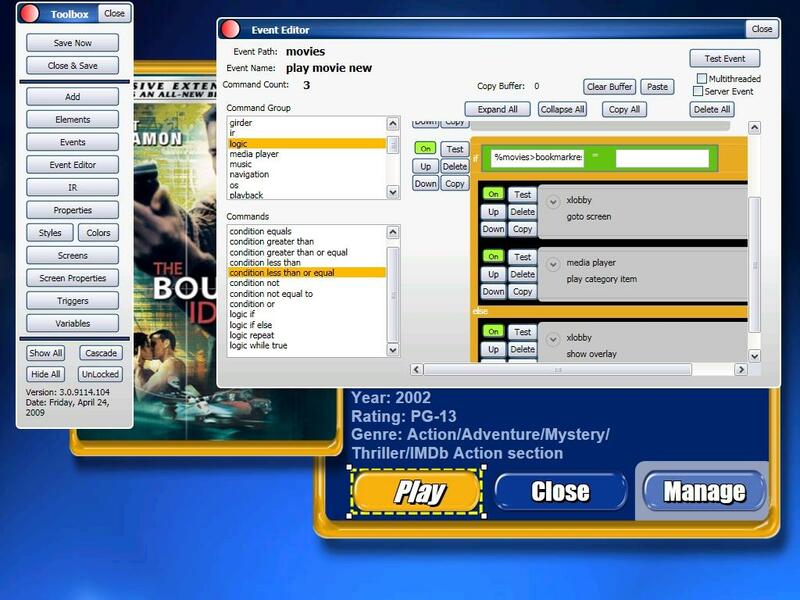 The Scaler / Converter also has a source loop thru feature as well as an easy to use OSD menu to change all the video and resolution settings. Calrads 40-400 Series Baluns work with all of our new 92 series IR distribution systems. 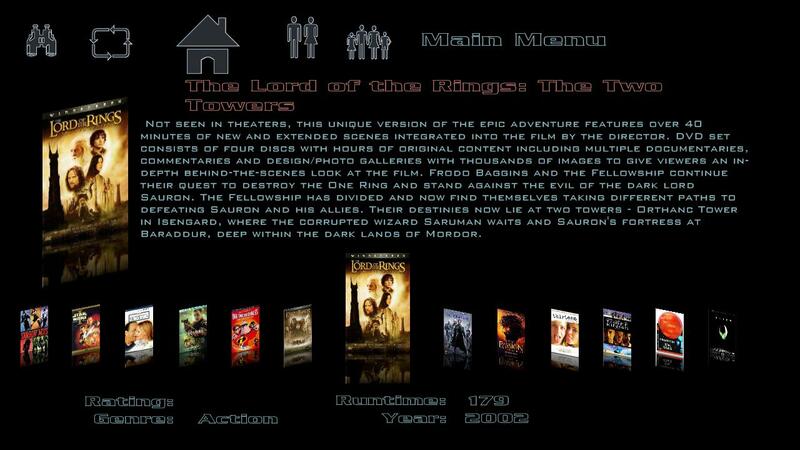 – 0000323: [generic] Movie Db delete item when files are non existing (stevenhanna6) – resolved. 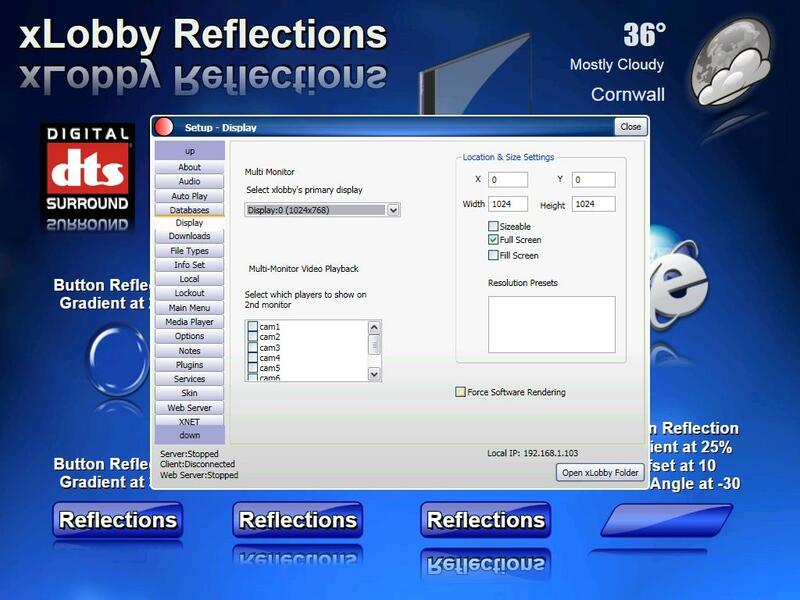 – 0000463: [skin editor] translate reflection by x co-ordinate (stevenhanna6) – resolved. – 0000465: [generic] winamp playlist import sometimes misses non ascii filename names (stevenhanna6) – resolved. – 0000462: [generic] volume bar for master volume can’t be controlled with mouse (stevenhanna6) – resolved. – 0000464: [generic] new command “xlobby->close overlay by name” (stevenhanna6) – resolved. 0000458: [generic] emulated keyboard commands up/down/etc sent through an event will cause a crash (stevenhanna6) – resolved. – 0000460: [generic] old (remote)_calrad_remote control_1.xml file causes conflict with new remote xml file (stevenhanna6) – resolved. – 0000459: [generic] mutli screen display zero/one will cause crash on exit (stevenhanna6) – resolved. 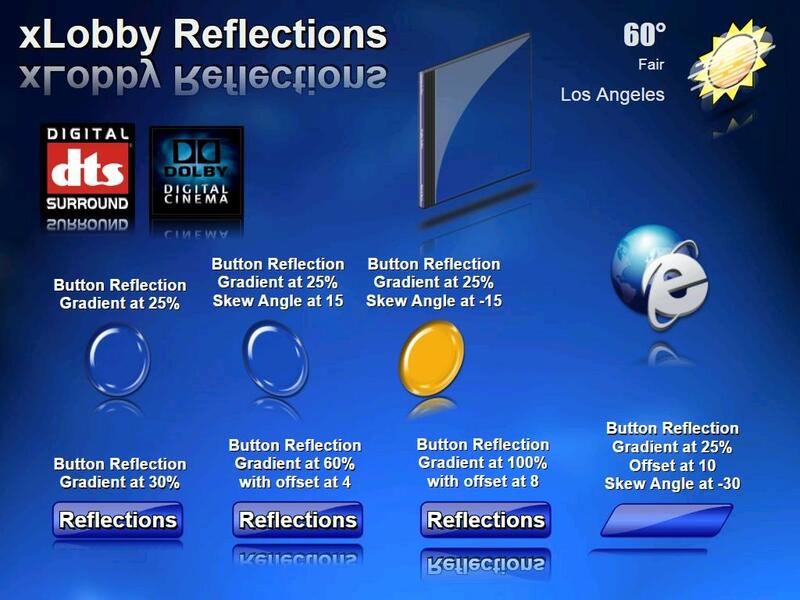 – 0000461: [skin editor] reflection opacity value, reflection skew x angle (stevenhanna6) – resolved. The latest versions of xLobby includes all the new services, Lighting, Russound, xController. A Basic instructions pdf file for using the new xController is included in the root directory of xLobby under Services, xController folder. The xController will let you speak to any device that communicates 2-way RS232 or IP based protocols. 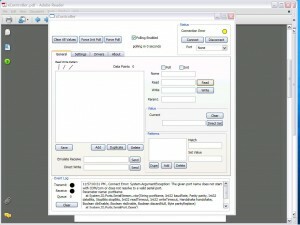 Create drivers for devices on the fly. Marbles is working on a new skin…….check it out…!, its still a work in progress. 1. Display 0,1 is working in the new build. 2. 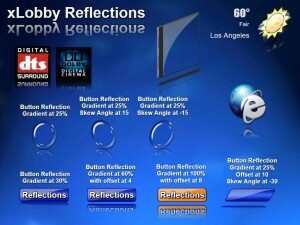 Reflections and image effects. 3. Several bug fixes, please see mantis for all the details. A. 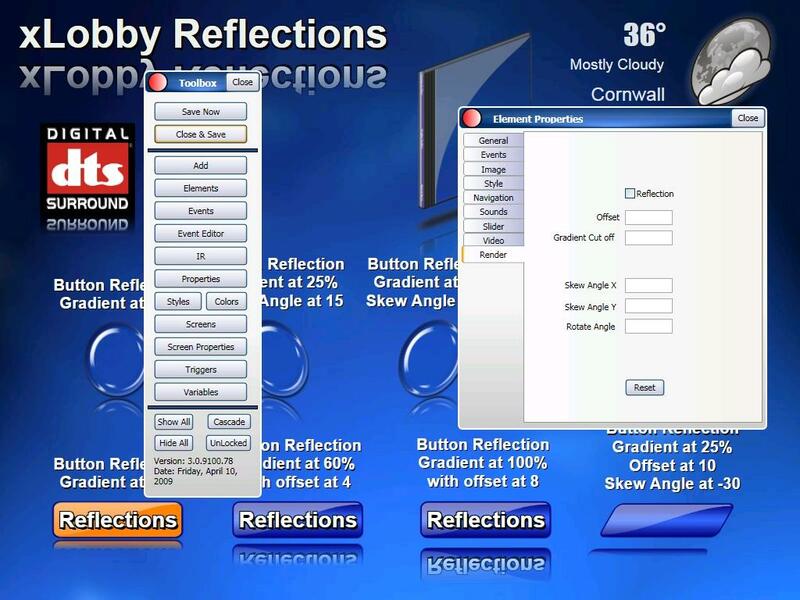 Offset, changes the reflections distance from the image, text elements. Works using positive or negative numbers. B. Gradient Cuttoff, chages the reflections gradient settings from 0-100, show or hides more of the reflection vertically. C. Skew Angle X, Skews elements Left to Right, Left to Right, works using positive or negative numbers. D. Skew Angle Y, Skews elements Up to Down, Down to Up, works using positive or negative numbers. E. Rotate Angle, Rotates images, text from 0 to 360 degrees. 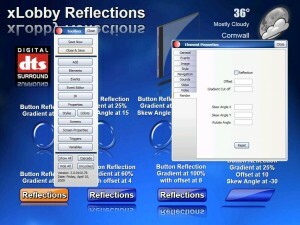 F. Reflection Opacity, Sets the Reflection Opacity. 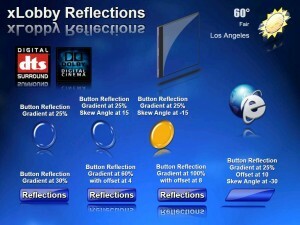 G. Reflection Skew x Angle, Sets the horizontal position of the reflection. Note: If elements are rotated or skewed, the object handles will not allow you to resize the image manually, this will be corrected on the next release. Size the image first before appling a rotation, also you can set values manually under properties, general. This News Post subject to changes and updates. 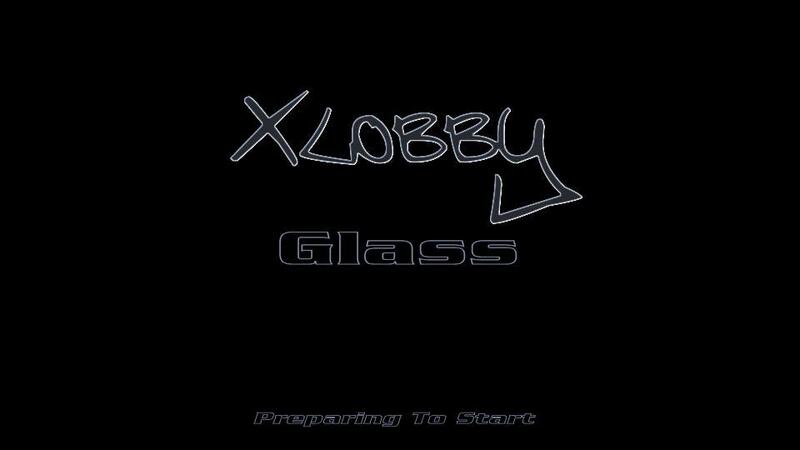 You are currently browsing the xlobby news blog archives for April, 2009.